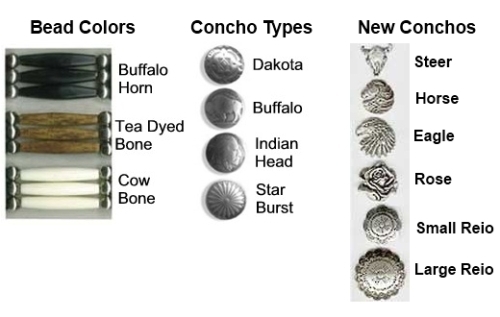 Your choice of (3) bead colors and (4) concho styles.. Double strand of beads with unique concho(s) and buffalo horn beads. 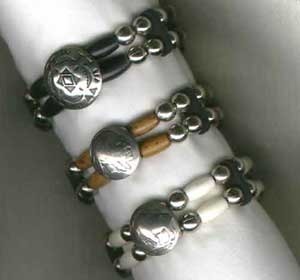 These Bracelets are beautifully hand crafted with a Native American and biker spirit. If you are not sure what size to order, please measure your wrist, and put the size on the special message section of the order form and we will make sure the proper size is made. These bracelets are custom hand made per order. Delivery is from 1 to 4 weeks. 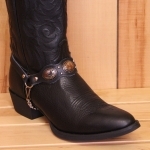 We also have available matching belts, boot bolos, boot bracelets, boot straps, hat bands, head bands, hair ties, key chains, earrings, chokers, and necklaces.